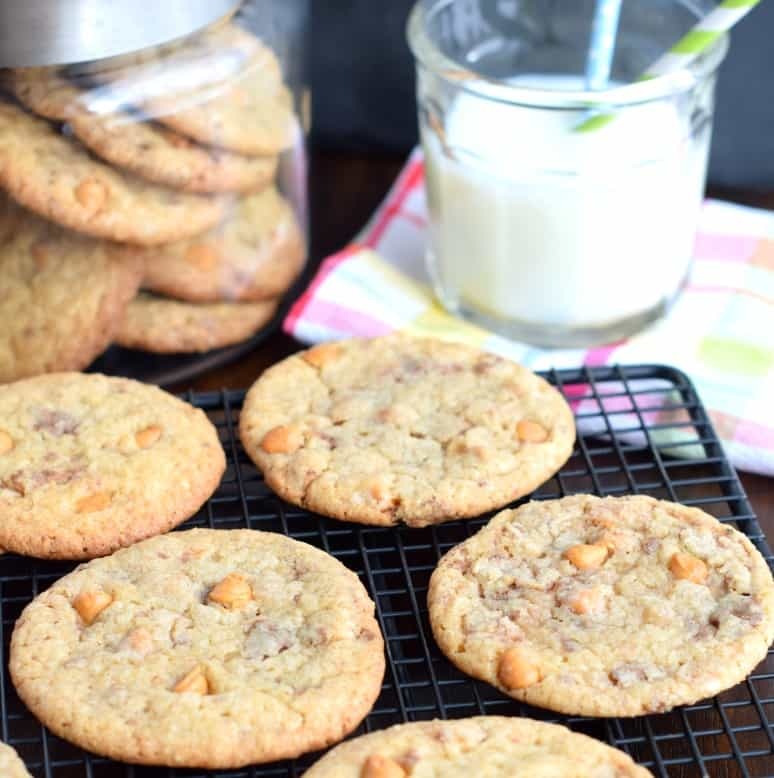 I’m in love with these Butterscotch Toffee Cookies! 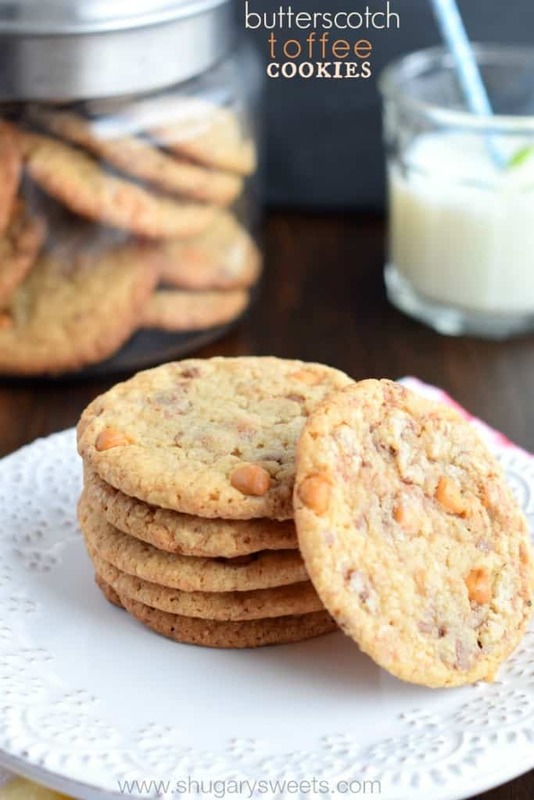 If you love chewy cookies, I’m pretty sure you’ll love these too! First, I apologize at how ugly these cookies may appear. Thin. Brown. Boring. But, OMG please do not let their appearance be your guide. These cookies may be one of the best cookies I’ve ever made. Yeah. Really. Although, to be fair, I have a deep love for butterscotch morsels. And toffee bits. So there’s that. Did I mention these are giant too? I used my 2 Tbsp scoop, and because the brown sugar and toffee caramelize together in this cookie they spread. Even after refrigerating the dough for an hour. Don’t be alarmed (be prepared!). Space these cookies out at least 3 inches apart. And don’t overcook them either. Mine took about 12-14 minutes, I let them cool completely on the pan before moving to wire rack. And did I tell you yet to use parchment paper? Seriously a must with these cookies. All these rules, are you afraid? Please don’t be! Just trust me when I tell you how wonderful these taste. The sweet butterscotch, the chewy toffee, these cookies ruined my healthy eating last week. But, they were the perfect treat to pack in my kid’s lunches on their first day back to school!! (I may have been more excited than they were about that!). As I do with most of my cookie baking, you can drop your cookie dough onto a parchment paper lined baking sheet and freeze for an hour. Then package up those cookie dough balls and store in a freezer safe bag until you are ready to bake some fresh, chewy cookies! At any given time there may be dozens of cookie dough balls in my freezer just waiting to be baked up fresh! So who’s coming over for fresh cookies? In a large mixing bowl, beat butter with brown sugar until well blended. Add in eggs, vanilla and milk. Add flour, baking powder and salt. Mix until fully combined. Beat in butterscotch and toffee bits. Drop by 2 Tbsp scoop on baking sheet, spacing 3 inches apart. Bake or 12-14 minutes. Cool on pan, then remove to wire rack. Store in air tight container. 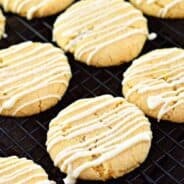 Classic Peanut Butter Cookies: make these delicious chewy cookies! 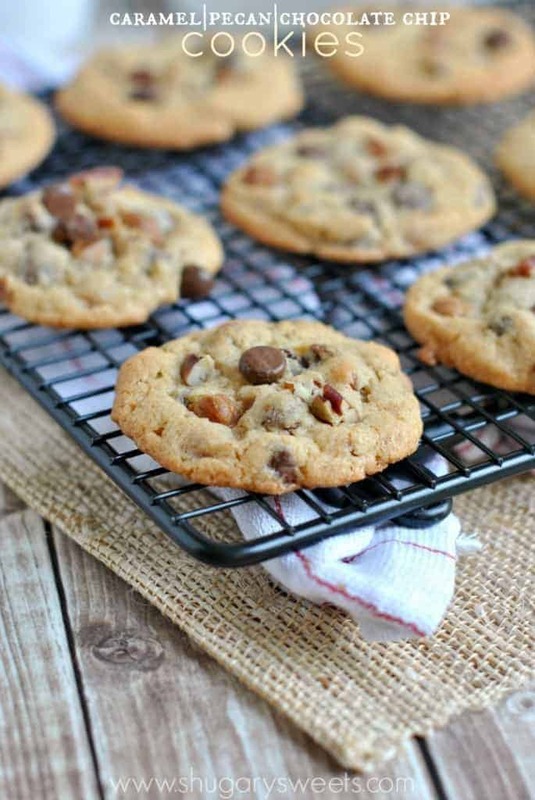 Caramel Pecan Chocolate Chip Cookies: chewy cookies that taste like a turtle candy! 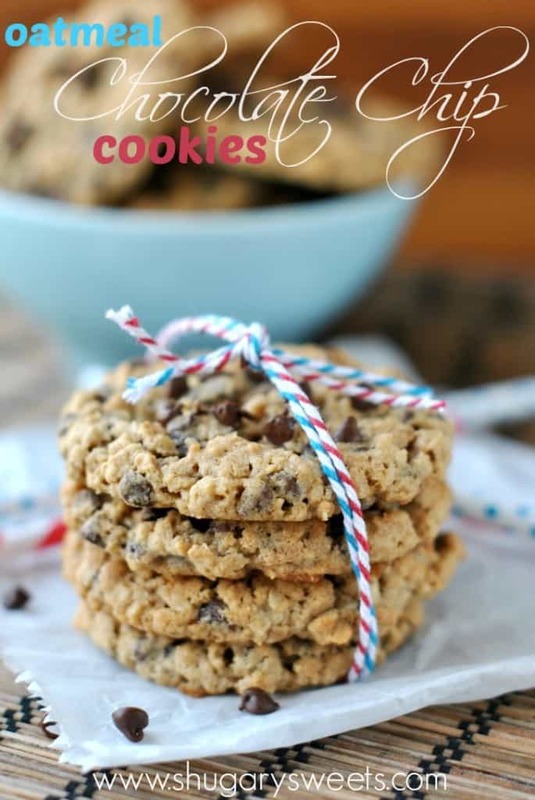 Oatmeal Chocolate Chip Cookies: no raisins in these sweet treats! I had to take a healthy break and bring on some cookies. Don’t worry, I’ve got a chocolate cake coming soon…as well as another smoothie! haha!! Brown is so hard to photograph!! But I love these pictures and these cookies! Brown is tough. And I’m so not creative with photographing cookies, LOL. But yeah, they are delicious! Love these butterscotch-filled morsels of sweet bliss! This is my kinda cookie! I just LOVE anything butterscotch/toffee/caramel. Like little bites of heaven! 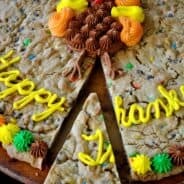 These cookies sound amazing! I love that combination! 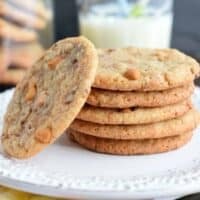 Oooh I love butterscotch and toffee in everything, and these sound so right up my alley! I totally need to try making these, ASAP. They’d be a hit in my house. Pinned! These biscuits look very delicious! Thank you for the recipe. I can’t wait to try it! When I looked at the picture, I was thinking “How are these perfectly round? !” They look amazing Aimee! These cookies look fantastic, Aimee! I love the butterscotch and toffee combination. And I love how thin these are, too. Pinned! I have a package of toffee bits in my pantry waiting to be used! This looks like a perfect way to showcase them! I think you need to use them in these cookies!! Yay for awesome chewy cookies that the whole family adores!!! I do love butterscotch chips too, but I always forget to use them! Must fix that soon!!!! 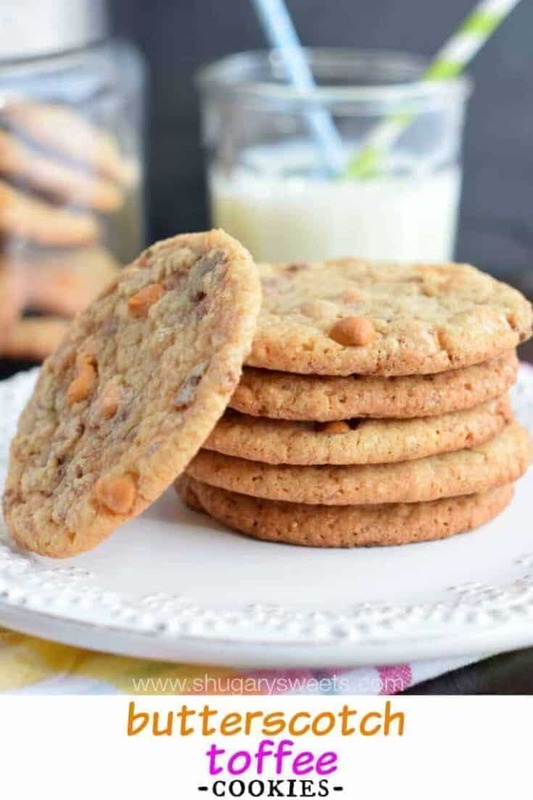 Butterscotch and toffee is such a great combination! These would be a hit at my house! Best flavor combo! These look perfect. Don’t ever apologize for what “you” think doesn’t look good! These cookies looks perfect! I love how thin they are. They look like they would melt in your mouth. That is definitely a good thing! Butterscotch and toffee has to be one of the best combos. Pinning! What time should I be over? I’ll stop and pick up coffee on the way-these cookies have my name written all over them! Pinned. I am totally with you on the love of butterscotch and toffee! I’m going to have to try these cookies. These look anything but boring, Aimee! I love anything with butterscotch and toffee. And these look chewy and perfect! These look so tempting right now! 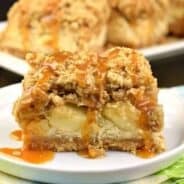 I can’t have cane sugar, so I might save this recipe and try it with coconut sugar. I bet my kids would love them. Perfect afternoon snack! This looks so good, I can almost smell these cookies through the screen! Pinned. I don’t think these are ‘ugly’ at all but even then, rustic looking foods often taste the best! 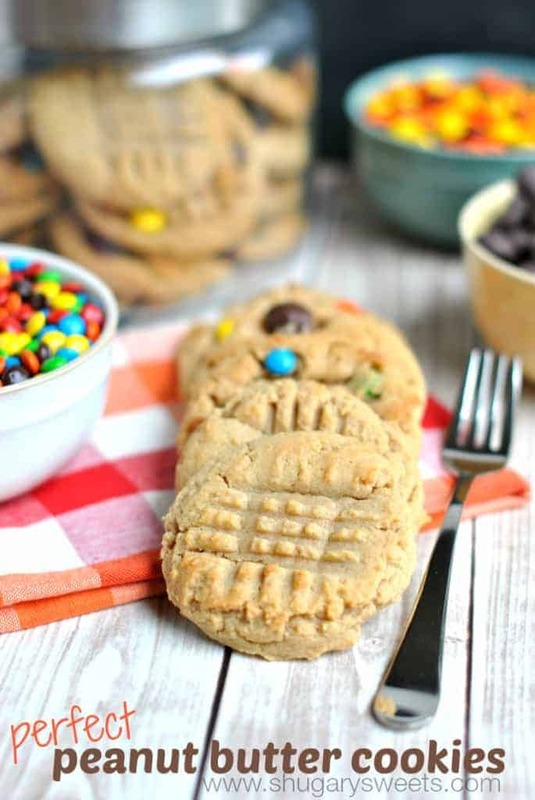 I am loving seeing cookies and these sound very flavorful with an awesome texture. We are big fans of chewy cookies in this house! The cookies don’t look ugly at all! All I need is a baker’s dozen and a glass of milk! I want to reach through the screen and grab three! These are EXACTLY my kind of cookies!!!!! yay, so glad you like them 🙂 Now you need to go bake some! Amy, these are the cookies of my dreams! Seriously, I love everything butterscotch (the morsels are addicting), caramel, toffee and anything Butterfinger-ish. Thank you for sharing and have a great rest of the week! What an awesome flavor combination!! Cookie dough in the freezer is a must. Who doesn’t want access to warm cookies. I think these look great. I love the butterscotch and toffee combination. Mmmm. Delicious cookies. I want. Made these this morning and knew I did not have time to refrigerate the dough…so, used 1/2 cup white sugar instead of all brown sugar (I thought the brown sugar contributed to spreading and that is what I was afraid of)…reduced oven temp to 350 degrees…turned out perfectly with no chill time. I made some regular sized cookies and some jumbo! Very tasty cookie that I think my co-workers are going to love.